These are not good times for the Republic (and if you laughed or scratched your head at me calling America a republic, I rest my case). But they are amusing times, at least for those of us capable of extracting some measure of mirth and schadenfreude from the president's predicament. With the sand running out on the Obama presidency, it's finally dawning on the president's friends and fans that he can be a real jerk. Consider the Washington Post's Dana Milbank. For the last six years, he's spent much of his time rolling his eyes and sneering at Republicans. His subspecialty is heaping ridicule on conservative complaints about, well, everything and anything. If it bothers conservatives, it must be irrational, partisan, churchy, fake, hypocritical -- or all of the above. Meanwhile, poor Barack Obama, while not always without fault in Milbank's eyes, is the grown-up, the good guy trying to do good things amidst a mob of malcontents and ideologues. That is, until this month. President Obama wants to get a trade deal passed. He needs Democrats to do it. But, Milbank laments, Obama's blowing it. "Let's suppose you are trying to bring a friend around to your point of view," Milbank writes. "Would you tell her she's emotional, illogical, outdated and not very smart? Would you complain that he's being dishonest, fabricating falsehoods and denying reality with his knee-jerk response?" "Such a method of a persuasion is likelier to get you a black eye than a convert," Milbank notes. "Yet this is how President Obama treats his fellow Democrats on trade ..."
Yes, well, true enough. But lost on Milbank is the fact that this is precisely how Obama treats everyone who disagrees with him. When Obama -- who ran for office touting his ability to work with Republicans and vowing to cure the partisan dysfunction in Washington -- treated Republicans in a far ruder and shabbier way, Milbank celebrated. Of course, he was hardly alone. The president has spent his entire presidency insisting that his political opponents are, to borrow a phrase from Milbank, "emotional, illogical, outdated and not very smart." Republicans, in Obama's view, are always dishonest, fabricating falsehoods and denying reality with their knee-jerk responses. To pick just one of countless examples, there was a White House summit on health care in 2010. The president invited members of Congress to discuss the issue in good faith. He then proceeded to treat every concern, objection and argument from Republicans as dumb, dishonest or emotional. They were, according to a column by Milbank, "stepping into Prof. Obama's classroom." Milbank marveled at how the "teacher" treated them all "like his undisciplined pupils." Whenever someone said anything politically inconvenient, the president replied that those were just partisan "talking points." When Sen. John McCain, his opponent in the previous election, noted that Obama had broken numerous promises and that the 2,400-page bill was a feeding trough for special interests, Obama eye-rolled. "Let me just make this point, John," Obama said. "We're not campaigning anymore. The election's over." He responded to Sen. Lamar Alexander -- he called him "Lamar" -- "this is an example of where we've got to get our facts straight." When it was Rep. John Boehner's turn to speak, Obama reprimanded "John" for trotting out "the standard talking points" and, in the words of a palpably impressed Milbank, forced Boehner to "wear the dunce cap." Again, this was all quintessential Obama then, and it's quintessential Obama now. All that has changed is that he's doing the exact same thing to Democrats, and it's making them sad. Specifically, he's accused Sen. Elizabeth Warren of not having her facts straight. He says she's just a politician following her partisan self-interest. But here's the hilarious part: Liberals can't take it. The president of NOW, Terry O'Neill, accused Obama of being sexist. O'Neill sniped that Obama's "clear subtext is that the little lady just doesn't know what she's talking about." She added, "I think it was disrespectful." 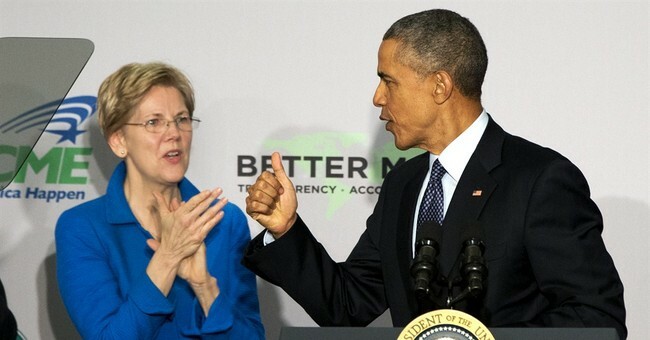 Both O'Neill and Sen. Sherrod Brown also sniff sexism in the fact that Obama referred to Warren as "Elizabeth." "I think referring to her as first name, when he might not have done that for a male senator, perhaps?" Brown mused with his typical syntactical ineptness. Of course, in that White House health care summit and in nearly every other public meeting with Republican senators and congressmen, he referred to them all by their first names. The great irony is that when Republicans complain about Obama's haughtiness and arrogance, liberals accuse them of being racist. I hope I don't miss that phase of this spat while I'm off making the popcorn.